You spend hours crafting the perfect email copy. You compose a masterful subject line. You toil over the opening sentence. You pour your blood, sweat, and tears in your copy. That’s hard work. It may not be smart work, especially if you don’t have an email marketing funnel. An email marketing funnel helps you maximize your marketing efforts. A funnel is wide at the top and narrow at the bottom. An email marketing funnel assists you in understanding your clients better. With it, you can understand the buyer’s journey. The buyer’s journey is the path a customer travels as they learn more about your brand. It starts with discovery and ends with conversion, possibly even extending past that to advocacy. Email marketing is about sending the right email at the right time. That idea closely relates to the email marketing funnel. For instance, if you send a sales email to subscribers who aren’t ready to buy, you may turn them off. If you don’t send your sales email to prospects who want to buy, you’re leaving money on the table. A group of potential customers will enter your funnel. Let’s say 1000 customers visit your website; 25 of them may buy your product, and maybe three may delight in your company deeply and share their experience they had with their friends. A lot of people won’t make it to the end of the funnel. This is to be expected. There will always be people that exit your funnel. You want to minimize this number. To reach this end, you have to understand where your customers are in the buyer’s journey. That way you can give them the content they crave. A funnel has three stages: discovery, consideration and conversion. The type of content you give your prospects depends on what stage they’re in. In the discovery part of your funnel, your goal is to show the value of your service or product. You want to provide informational content while sparking a relationship with your client. You are going to increase the awareness of your brand by doing this. There are some cases when the value of your industry is not too apparent; this is why you need to educate the market. You need to use content marketing that generates interest during this stage. Customers aren’t looking for your name at this stage; they must have an interest in your brand in order to do that. At this stage, you want to move your way into their list of trusted brands. At the top of the marketing funnel, you should minimize talking about your brand. Instead, figure out what is the market asking for. After you do this, craft the content they want. This way you are getting the exposure your competitors aren’t. Likewise, you’re making yourself an authority in the industry. As with the other stages, send your content to your segmented email list. Here are the types of content that work well in the discovery phase of the email marketing funnel. When you write articles on your blog, you make a great investment. Your customers will have content to choose from. Blogs are the heart of content marketing. They are a perfect outlet to teach the masses. In order to create a great discovery blog post, you have to follow some guidelines. Your content has to be clear, informative and simple for your clients. A professional freelance writer can do this job for you. Webinars are web-based seminars where your customers can see a conference using video conferencing software. The reason why webinars are so good in the discovery phase is that they are interactive. You can give, receive, and discuss information in real-time. This personal medium is ideal for gaining trust from prospects. What is big content? These are 3000+ word blog posts, the kind that Neil Patel recommends. Why does this content succor the discovery stage? This kind of content dominates search engines, particularly if your on-page SEO is in place. The higher you rank in search engines, the easier is to get more people at the top of the funnel. Guides are always a fan favorite. They provide great information alongside a reader-friendly format. They are perfect for scanning, which a lot prospects do in the discovery stage. You can’t go wrong with these. Another interactive way to introduce your clients to your brand is by creating specific videos. Quick and general tutorials are ideal for the discovery stage. People write about niche topics, but they often don’t make videos about them. The opportunities here are abundant. Informational short videos work as a catalyst in the process of getting new prospects. They next stage is the consideration phase. In this stage, the prospect is going to think about your offerings. They want to discover what you’re all about. Are you right for them, or should they choose a competitor? Now you have more info about your prospect than you had in the previous stage; this is why you’ll give them focused content that soothes a particular pain point. You can even do this while showcasing your product. When you do this, you’re gaining trust. If you solve people’s problems, they’ll want to buy from you. In this stage, you are going to build a deeper relationship with your client. The goal is to attract them with contextual or targeted content. You have to provide tailored content and deliver helpful information. The consideration phase is a great opportunity. During this stage, clients will be looking for this type of content. You can show your clients what benefits they get after they use your product. For example, brands that sell fitness programs have “before and after” photos of their clients. You can make some blog posts with how-to content that relates to the product you sell. For example, let’s say you have a company that sells compound bows. In this case, you can make an article titled “Learn the Tricks of Properly Shooting with a Compound Bow” in which you will include tips and tricks on how to become a better archer. You can even use your bow in the video. Demo videos are great content that gives a lot of information to visual learners. Your clients will see why your service is the missing factor in their lives. A simple video can do things a blog post can’t. You love statistics, don’t you? When you include data sheets that show statistics about your product, you are going to increase the value your product. You can bundle this information in an infographic, or something like that. Using specific information (i.e. our product removes 97% of scar tissue), is much better than vague boasts (i.e. our product removes a lot of scar tissue). Conversion: the time your client makes a decision. Once they know about the benefits and the value you provide, they are going to come to a conclusion. You need to let your customer know what’s next. You need to let them know what to expect when they buy. The clients that remain are very interested in what you are offering. This is the time to start boosting up your own services and showing the differences between you and your rivals. Why is your product ideal? You should let them know in this stage. Rather than just explaining features, show how your product will help their lives. Your goal is to make your subscriber purchase. You can do this by deals. You can compel customers to purchase right away. Yet, your best friend here will be content. Battle with value, not price. Your customers don’t want to feel buyer’s remorse. That’s probably their biggest fear. Your content should allay those concerns. Here’s some of the most valuable content you can create that will help you at this stage. Testimonials earn trust. You can ask former clients to write a testimonial. Do you not have any takers? You can offer them a discount or a bonus. Introduce the testimonials in your email marketing campaign. In this case, reviews are mainly unsolicited testimonials. They are powerful and sometimes easier to obtain than testimonials. Take Amazon for example: good reviews will boost sales. You can share positive reviews in your emails. Make it easy for customers to move from your email to the order confirmation page. For one thing, your site should be responsive to mobile. A lot people open emails on their phone. Make it easy for them to buy on their phones too. Conversion is not the end of the book, not the completion of the novel. Rather, it’s the beginning of a new tale. If a customer buys once, they may buy again. Focus on retention- turning first time buyers into loyal clients. Keep offering valuable content. For instance, if they just bought a television, they may be interested in a Roku. If they bought the first book, they may want the sequel. Use discounts and special offers to show your appreciation. Satisfied customers turn into big advocates. These people will introduce their family and friends to your site, placing them in the top of the funnel. 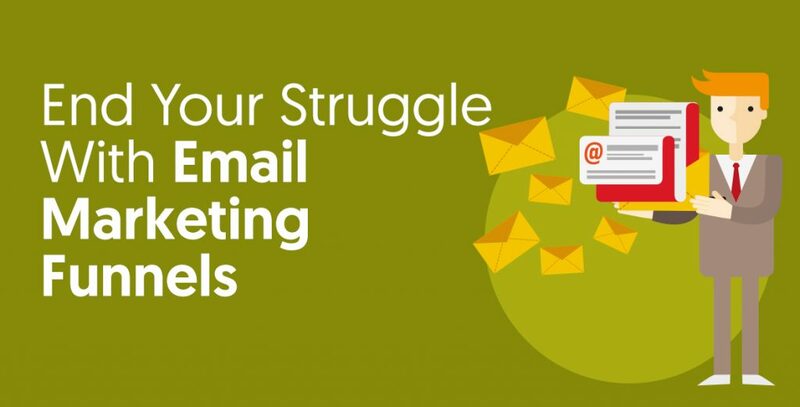 The email marketing funnel triggers a snowball effect that will accelerate your sales.